In March, 2009, Louisville was host to Dr. Toni-Mokjaetji Humber, Professor of Ethnic and Women’s Studies, Ms. La’Keisha Gilford-Beard, Coordinator, African American Student Center, and 23 students, Diversity Ambassadors, from California State Polytechnic University at Pomona, Pomona. The purpose of their week-long visit to the area was to study the Underground Railroad in Kentucky, Indiana and Ohio. Since 1999, the Diversity Ambassadors program at Cal Poly Pomona has taken students during their spring breaks on The Civil Rights Tour of the South to retrace significant events in the civil rights movement in Alabama and Georgia. After participating in the Underground Railroad tour with Ms. Judith Lalude, Founder and Director of the j. camille cultural academy, in 2007, Dr. Humber suggested the Diversity Ambassadors alter their focus for their tenth anniversary year to include the stories of courage and prominent sites along the Underground Railroad. Kentucky, a borderline slave state, was a major artery along the Underground Railroad. Enslaved Africans traversed Kentucky and headed north for the Ohio River to cross over into Jordan. Some were led by people such as Harriet Tubman, the Black Moses of her people. Sojourner Truth’s story persuaded many to flee Kentucky and Virginia and to cross the Ohio River into Indiana in search of their freedom. Many other freedom seekers continued their journeys into Canada. The Diversity Ambassadors traced the historic steps to freedom of courageous men and women who were both freedom seekers and conductors along the Underground Railroad. During the week, the Diversity Ambassadors covered a lot of ground. Starting in Ripley, Ohio (3-hour drive from Louisville, KY), where the Ambassadors performed the Circle of Imani (swahili for faith or belief) and gave libation ceremonies to the Ancestors at the Presbyterian Church in Ripley. While in Ripley the Ambassadors climbed the Stairways to Freedom, tour the John Rankin and John Parker House Museums. Then they traveled to Washington, Kentucky to visit the Thomas Marshall, Jr. Plantation, and held a candle ceremony at a slave auction site. They visited the studio of Louisville sculptor Ed Hamilton and traveled to Cincinnati, Ohio where they visited the Freedom Center and the Harriet Beecher-Stowe house. Their visit concluded with travel to Frankfort, Kentucky to visit the Kentucky Historical Society; Lexington, Kentucky to tour the Henry Clay Estate; and a tour of the Second Street Baptist Church in New Albany, Indiana. 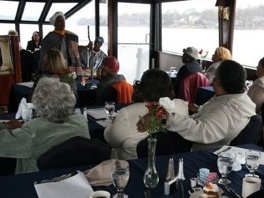 One of the highlights of the Diversity Ambassadors’ journey was the Slavery on the Ohio River, a riverboat cruise. The Diversity Ambassadors along with current and retired administrators and teachers from the Jefferson County Public Schools, as well as other members of the Metro Louisville community boarded the CQ Princess Yacht at Captain’s Quarters on River Road, Harrods Creek, Kentucky to experience the history of Slavery On The Ohio River. The cruise included lunch, a lecture by Dr. Alicestyne Truly-Adams, Director of the Underground Railroad Research Institute, Georgetown College, Georgetown, Kentucky, and the dramatic presentation of a mother and her son escaping to freedom, The Long Walk: From Slavery to Freedom, by Ms. Judith Lalude. Please click on the link to view the photos of the Slavery on the Ohio River cruise.